Synthetic peptide corresponding to Human PKC nu/PRKD3 aa 367-384 conjugated to keyhole limpet haemocyanin. Protein kinases are enzymes that transfer a phosphate group from a phosphate donor, generally the g phosphate of ATP, onto an acceptor amino acid in a substrate protein. By this basic mechanism, protein kinases mediate most of the signal transduction in eukaryotic cells, regulating cellular metabolism, transcription, cell cycle progression, cytoskeletal rearrangement and cell movement, apoptosis, and differentiation. With more than 500 gene products, the protein kinase family is one of the largest families of proteins in eukaryotes. The family has been classified in 8 major groups based on sequence comparison of their tyrosine (PTK) or serine/threonine (STK) kinase catalytic domains. The AGC kinase group consists of 63 kinases including the cyclic nucleotide-regulated protein kinase (PKA & PKG) family, the diacylglycerol-activated/phospholipid-dependent protein kinase C (PKC) family, the related to PKA and PKC (RAC/Akt) protein kinase family, the kinases that phosphorylate G protein-coupled receptors family (ARK), and the kinases that phosphorylate ribosomal protein S6 family (RSK). The calcium/calmodulin-dependent kinase (CAMK) group consists of 75 kinases regulated by Ca2+/CaM and close relative family (CAMK, CAMKL, DAPK, MAPKAPK). This antibody is purified through a protein G column and eluted out with both high and low pH buffers. It is neutralized immediately after elution, followed by dialysis against PBS. Our Abpromise guarantee covers the use of ab5285 in the following tested applications. WB 1/100 - 1/500. Detects a band of approximately 100 kDa. Western blot analysis of ab5285 in lysate of HL60 cells stimulated with PMA. PKCnu (arrow) was detected using purified Pab. Secondary HRP-anti-rabbit was used for signal visualization with chemiluminescence. 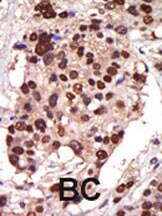 ab5285 staining PKC nu/PRKD3 in human breast carcinoma (BC) tissue by Immunohistochemistry (Formalin/PFA-fixed paraffin-embedded sections). ab5285 has not yet been referenced specifically in any publications. Publishing research using ab5285? Please let us know so that we can cite the reference in this datasheet. There are currently no Customer reviews or Questions for ab5285.